Last month I was in Ooty and stayed in the Fairstay Resorts which is about 1.5 km before the main Ooty town. I did not know anyone there, just looked up the reviews in tripadvisor and other sites and decided to pick this place based on the very good reviews that the customers had given. Here is my review on the resort based on my experience here. When they say resort, do not imagine anything big like a beach resort you would see in Chennai or any other city, but you can expect a decent hotel kind of a place. 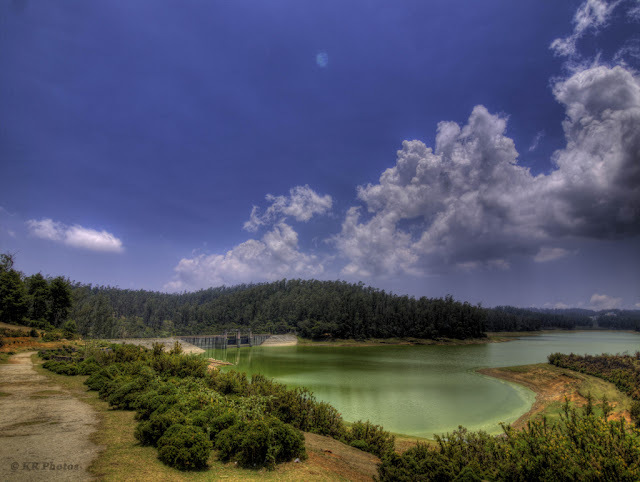 The resort itself is situated about 1.5 km before the main Ooty town. Which means you are out of the hustle-bustle of the crowded holiday town, but the same time the access to all the major tourist places are easily accessible through car / taxi. The resort only entertains people coming as a family and do not hesitate to turn down guys coming as a group so that they could maintain a good atmosphere. The rooms are quite spacious and maintained very well and clean. One cannot have too many complaints about the facility. A couple of nagging things about the place is that the approach road to the hotel from the main road is not paved well. It is quite bumpy, but that is only a stretch of few meters. This is a non-issue for me. Another problem that people may find is that you do not get mobile signal in the hotel rooms and there is no landline in any of the rooms if you want to make any urgent calls outside. They have a very clean kitchen and dining room. Though not very big, it is very well maintained. They provide only vegetarian food. If you insist on having non-vegetarian then they can buy it from outside. No preparation is done in the kitchen. The kitchen itself is very well maintained and they even encourage the guests to visit the kitchen if they want to, so that they can be sure about the hygiene of the food. The food as such is very good, like home-made food. In the package that I took, the breakfast was complementary and they had about 5 varieties of food every morning to choose from. They also provide dinner and change the variety everyday with rice and rasam as standard menu. The food was really tasty and hygienic! They do not provide lunch, which makes sense. After all you are not visiting Ooty to just sit back at the hotel room and eat and sleep. You will be going out to visit place, so manage the lunch outside! Off late, I have not seen this kind of excellent service from a common man’s hotel / resort. There is no surprise in a star hotel giving an excellent service, but I have not seen this kind of courteous and prompt service from a common hotel. Last, but the most important. It is the people who actually make excellent service. It is no surprise that the service was excellent as the people who work here know what they are supposed to be doing and are real professionals, though I doubt if they would have any professional qualification in hospitality institutes. Right from the director Mr. Anbumani to every staff of the hotel, everyone were polite, courteous and well behaved. And the same time very helpful and lively. I have to give special mention to Mr. Sathish who was our taxi driver right from the time we landed in Mettupalayam railway station. He picked us up from the station and guided us throughout the entire tour of 3 days giving loads of information about the place, people, culture, plants, trees, flowers and everything that you can imagine there. He definitely is an asset to any employer. He has the right kind of knowledge and contacts to get us to places which may normally need some prior bookings or permission. Overall it was a very good family vacation for me after a long time and the time was spent really well. To sum up, here are the pros and cons of the place. At Rs.2500 per night during the season time is a reasonable rate for this place. Located just outside the main town which makes the place calm and beautiful! Would I recommend this place to my friends? ABSOLUTELY! If you are planning to go with family, look no further. Fairstay is the place to stay! 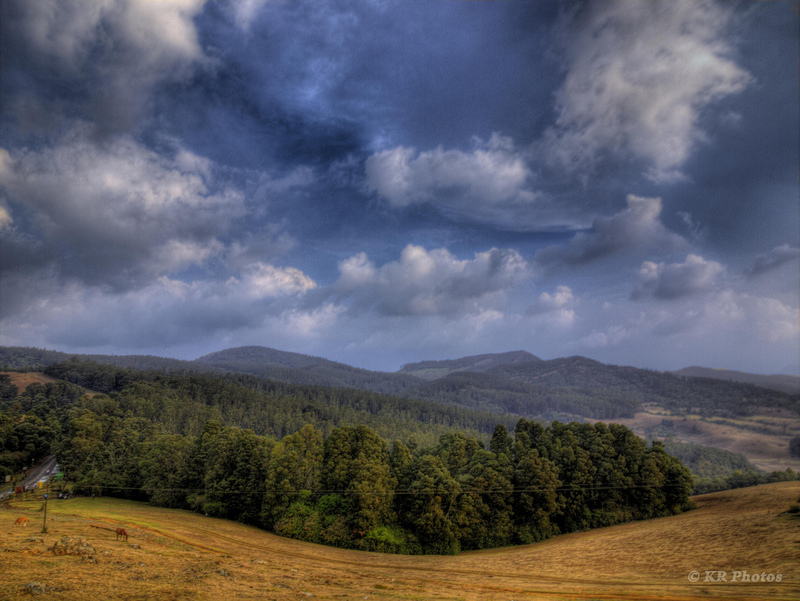 I recently visited Ooty and managed to take some landscape shots with the Olympus 11-22mm wide angle lens. I have never really given it any good work-out since I bought it sometime back. Given the weather and the beautiful landscape, I thought it would do justice to the beautiful place if I make it an HDR instead of just having a plain landscape photo which may not bring out the beauty always. So, here are the photos! 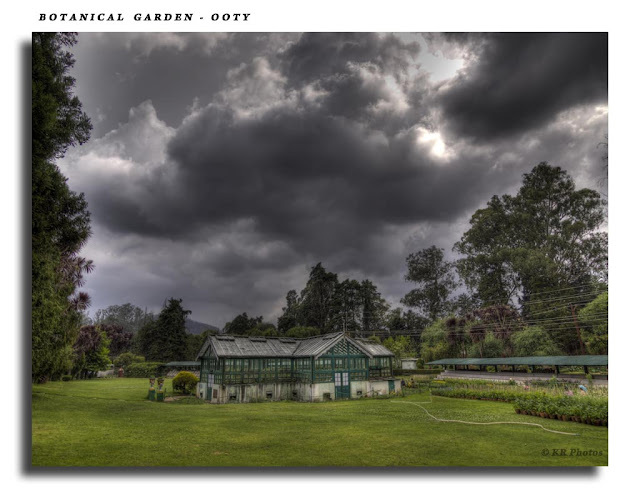 Botanical Garden with some good rain clouds forming over it. In fact it had actually started drizzling while I took this photograph. So I was fortunate to not have any moving people in the scene. 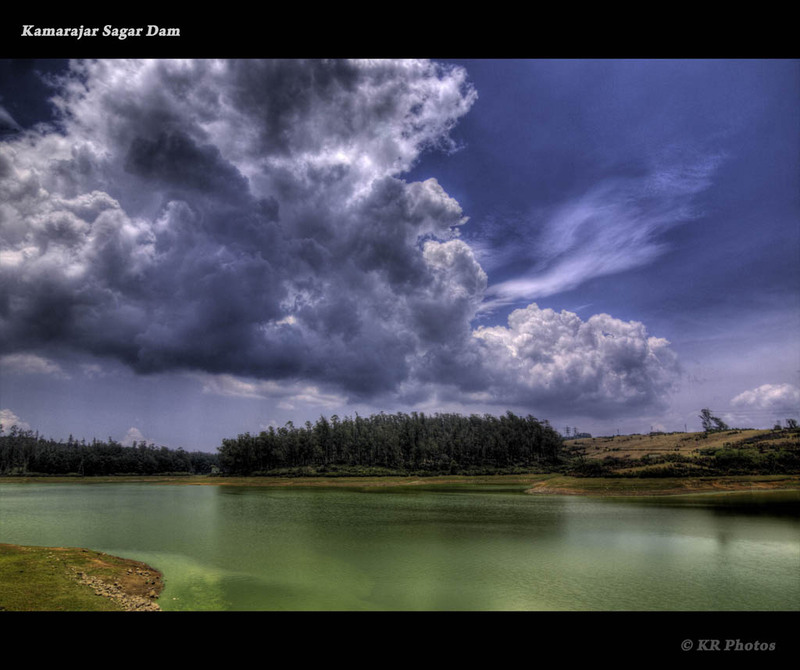 A view from the Kamaraja Sagar Dam. The colour of the sky and the water was so good that I wanted to bring out the spectrum of colours and the contrast it offered. 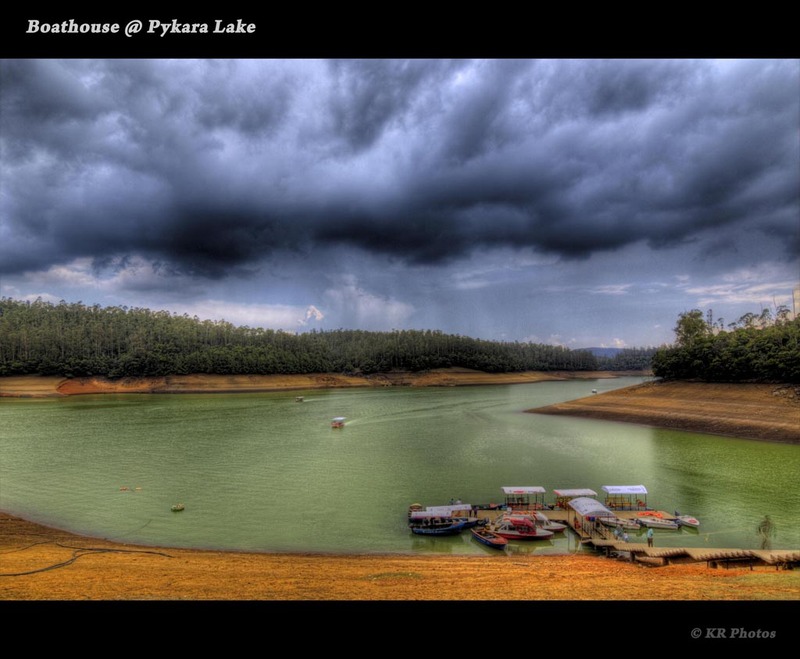 So went for the HDR. This above view has the Kamarajar Sagar dam itself. A view on the way to Pykara Falls. Once again had the resort to HDR here to bring out the contrast in the sky, water and the foliage. There were some people moving, so had to clone them out. 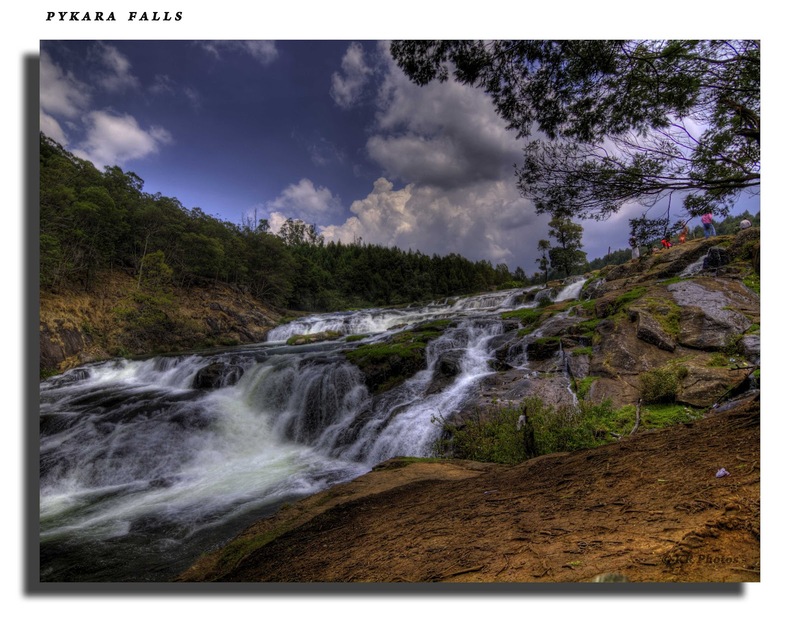 Another view of the pykara falls, before it turned to a falls. 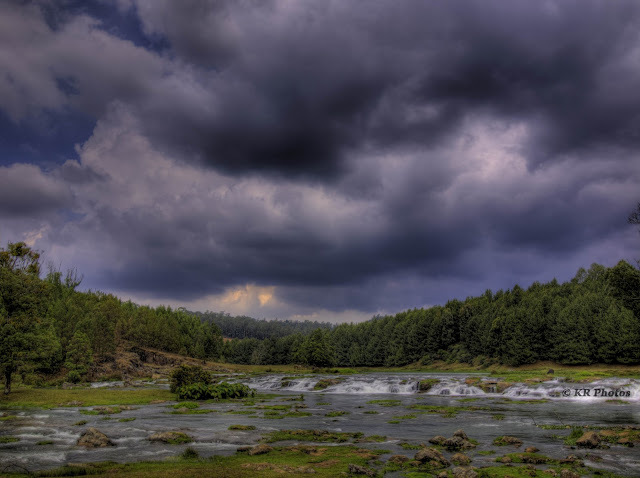 Given the unpredictable weather of Ooty, though it was bright and sunny, it could change completely within minutes. This photograph was taken only a few minutes after taking the previous one. 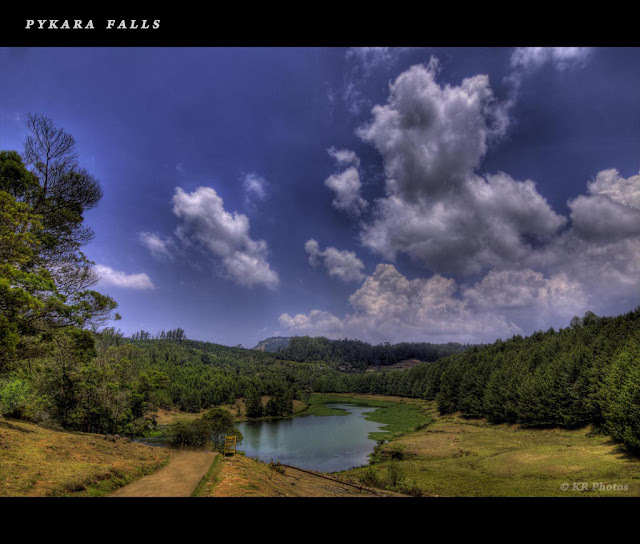 The pykara lake - this is a nature mountain spring and the water level will raise quite a bit during the monsoon. It had started raining by the time we finished boating. The weather changed completely from being sunny to rainy in a matter of few minutes. The winch at Glen Morgon, used to reach the hydro-power station. If one travels through the road it would take about half day to reach the place, in case of any repair required. But through the winch it would take only about an hour. This beauty was built during the British rule and is being used it now. The angle at which the winch travels is 45 degrees. This is one of the steepest winch climbs anywhere in the world! A view at the 9th mile. 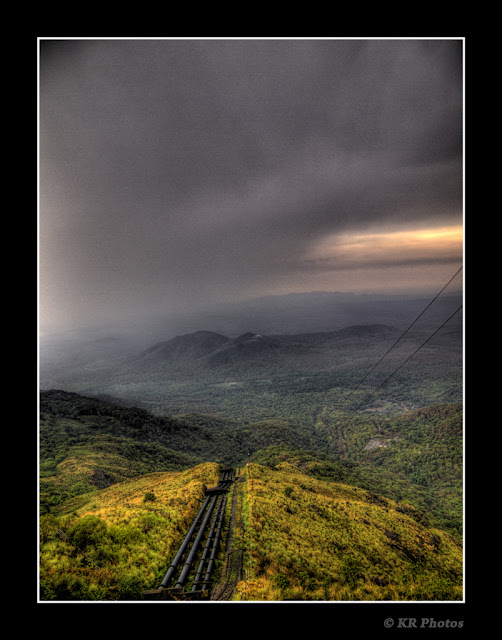 This is one of the most famous shooting spots in entire South India. Number of scenes shot in this place is just countless. Tree Park - This one is near the Ooty lake but almost never visited by any tourist. 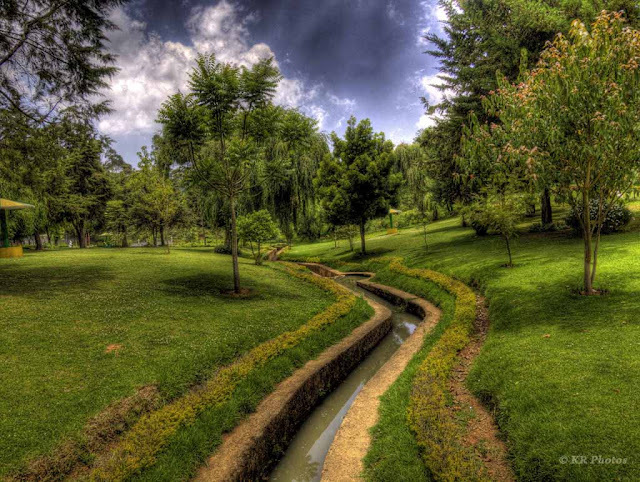 This place is very small when compared to the Botanical Garden, but very neatly maintained and beautiful. This place has trees from many parts of the world. Another view in the Botanical garden. 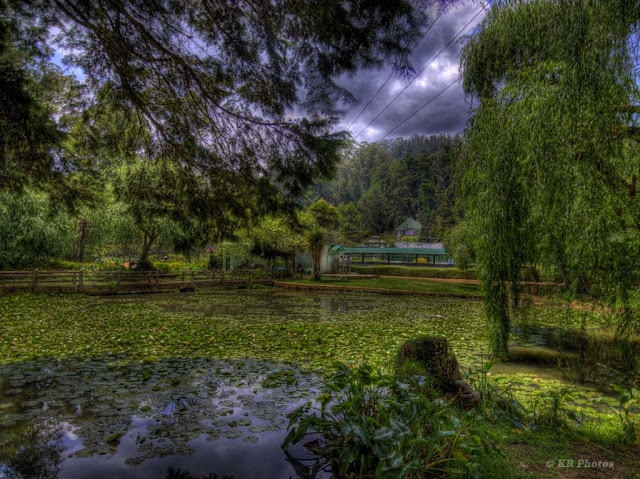 This pond can be seen as one enters the botanical garden in Ooty. This is the first time I have tried so many landscapes, that too in HDR. I had deliberately left behind my Sigma 50-500mm lens as I might restrict myself too much on bird photos. I wanted to try some landscape shot and these are some of the ones I came up with. Your feedback and comment on this would be a great help.